Crugybar Mabon Mai was born in 1990 and is by Derwen Desert Express and out of Penardd Boremaii who is by Ffrwdlwyd Flying Childers. He is the winner of the 2005 & 2006 Section D Sire Ratings. 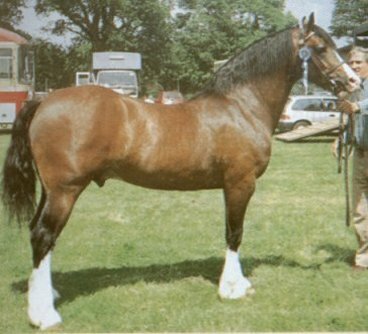 Mabon is the sire of the 2002 Prince of Wales Cup winner Gwynfaes Culhwch. He is also the sire of the double Royal Welsh winner Tymor The Tramp and Royal Welsh winners Tymor Pele and Tymor Lammtarra. Also sire of the Youngstock Champion at the 2005 Royal Welsh - Llanarth Prince of Wales.